Some Misunderstandings About Tankless Water Heaters | Ken Neyer Plumbing, Inc. 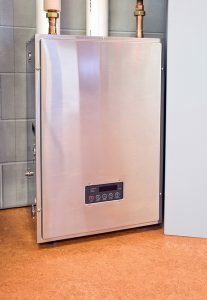 This is a confusion between a tankless water heater with a hot water recirculation system, which is a set-up that can immediately deliver hot water to taps. As with a storage tank water heater, there’s delay time between when a tap comes on and when the tankless water heater can deliver the hot water. Because tankless water heaters work differently from standard water heaters, it’s easy to assume they won’t be able to keep up with household demands. However, as long as the water heater is properly matched to your household’s standard hot water usage, there’s no reason it can’t deliver as much hot water as you need every day. In fact, tankless water heaters won’t run out of hot water at all, the way a storage water heater can. It is true that tankless water heaters are more expensive to purchase up front than standard units, and in some situations, it’s simply a better match for a household budget to stick with a storage water heater. But the long-term savings from a tankless water heater are tremendous, and installation will rapidly pay for itself and then keep delivering savings. Tankless water heaters are around 25% more efficient than other water heaters, and that’s before considering how less often these water heaters have to run. Tankless water heaters only come on when there’s demand for hot water, while a storage tank water heater must run regularly to keep replacing heat lost from the tank. There’s no one-size-fits-all tankless water heater! It’s important to have the flow rate and temperature differential of the water heater matched to the home to ensure there’s enough hot water to meet daily needs. However, you won’t have to worry about choosing the right water heater for your household—that’s where our professionals come in. You can trust to our team to ensure you end up with the best water heater solution. We not only install storage tank and tankless water heaters, we also install heat pump water heaters, which are beneficial for homes that don’t use natural gas power. Ken Neyer Plumbing, Inc. has served Greater Cincinnati and the surrounding Tri State area since 1972. Talk to our water heater professionals today.